Wilkesboro, NC -- Vince Gill, one of the most popular and honored performers in country music today – and one of the most respected musicians in Nashville – has been added to the MerleFest 25 lineup. Gill will perform on Thursday, April 26, delivering the closing performance of the evening. MerleFest 25, presented by Lowe's, is slated for April 26 – 29, 2012, and will once again take place on the campus of Wilkes Community College in Wilkesboro, North Carolina. MerleFest is an annual homecoming of musicians and music fans, gathering to celebrate the memory of musician Eddy Merle Watson, beloved son of American music icon Doc Watson. 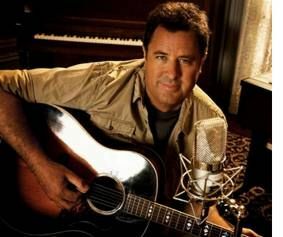 Such blockbuster hits as "Go Rest High on That Mountain," "Whenever You Come Around" and "I Still Believe In You" have helped Vince Gill sell more than 26 million albums over the course of his highly successful career. He has earned 18 CMA Awards, including Entertainer of the Year in 1993 and 1994. He is tied with George Strait for having won the most CMA Male Vocalist Awards (five), and is currently third only to George Strait (22) and Brooks & Dunn (19) for accumulating the most CMA Awards in history. Gill is a member of the Grand Ole Opry and has received 20 Grammy Awards to date. Just last month, Gill scored his 41st Grammy nomination as a co-writer on "Threaten Me With Heaven," nominated for Best Country Song. In August of 2007, the Country Music Association inducted Gill as a member of the coveted Country Music Hall of Fame. Gill's most recent project, Guitar Slinger (released in October 2011) is a favorite of both fans and music critics across the country, with iTunes proclaiming "Vince Gill's superlative work in the '80s and '90s remains a high standard to reach, but he exceeds expectations on Guitar Slinger… When it comes to musical finesse and pure feeling, nobody does it like Vince." An avid golfer, Gill helped create the annual Vince Gill Pro-Celebrity Invitational Golf Tournament ("The Vinny") in 1993 in order to help support junior golf programs throughout Tennessee. Besides being known for his talent as a performer, musician and songwriter, Gill is regarded as one of Country Music's best known humanitarians, participating in hundreds of charitable events throughout his career. With over 90 artists performing on 14 stages during the course of the event, MerleFest 25 is an excellent entertainment value. A complete list of confirmed performers is available at www.merlefest.org. Additionally, up-to-the-minute lineup additions for the festival can be obtained through the festival's e-newsletter and through Facebook and Twitter. MerleFest, considered one of the premiere music festivals in the country, is held on the campus of Wilkes Community College in Wilkesboro, North Carolina. MerleFest was founded in 1988 in memory of Eddy Merle Watson and is a celebration of what Doc Watson calls "traditional plus" music, meaning the traditional music of the Appalachian regional plus whatever other styles we were in the mood to play." The annual festival has become the primary fundraiser for the WCC Endowment Corporation, funding scholarships, capital projects and other educational needs.